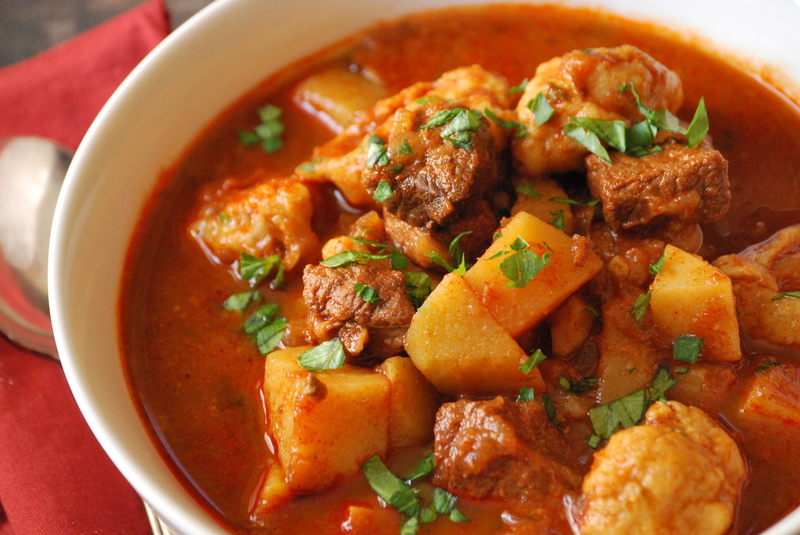 Paprikash. Just saying it reminds me of being a little girl, coming in from playing in the snow to that amazing aroma of paprika wafting through our farmhouse. My brother and cousins were there, of course, with the same frigid hands and red wind-blown cheeks. This soup– more than any other meal– defined my childhood. Paprikash is nourishing and delicious, but it’s so much more than that to me. It’s family and friends. Paprikash meant company was about to arrive, and that we kids had the freedom of the farm while the adults chatted the afternoon away. It meant the comfort of having my parents, siblings, grandparents, aunts, uncles, and cousins all together to share a communal meal. And now, paprikash is nostalgia. It’s a bit strange to write about it here. It’s bittersweet because I loved those days, and know that I can never have them back. I’m reminded of how very lucky I was to grow up in rural North Dakota– to see my extended family every week. This soup reminds me of those family traditions. I love traditions. I also love this soup. This is my version of paprikash. Like nearly every mother, grandmother, and aunt in my hometown, I’ve developed my own take on this Hungarian soup. The foundations are the same: beef, onions, potatoes, and dumplings. And they’re all enveloped by a thick, rich, beef broth. 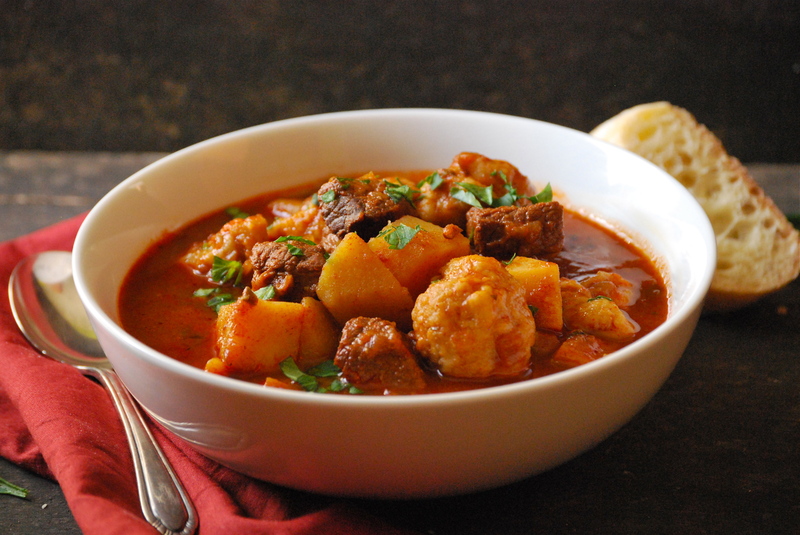 It’s a hearty soup that has a profoundly deep, comforting, flavor thanks to sweet paprika. This is the bowl you want to eat when the snow is falling outside your dining room window. Now for a few pointers. 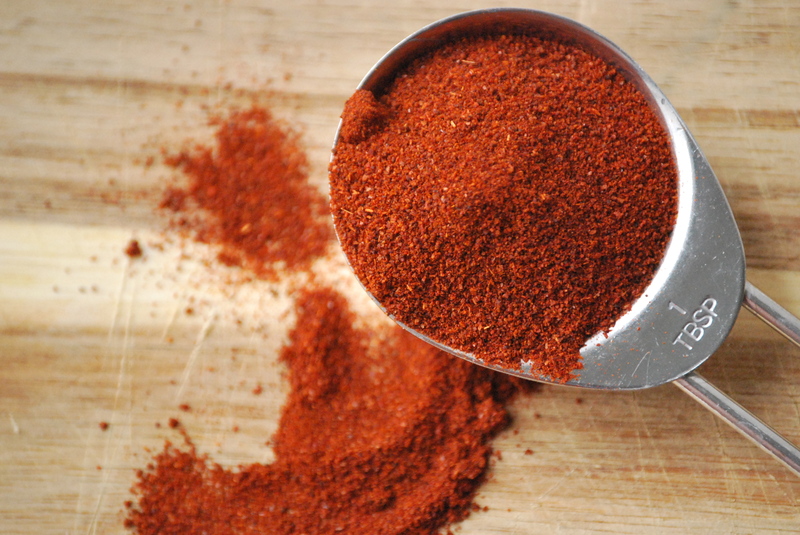 First, use good paprika. I can’t stress this enough. The paprika is the canvas upon which the rest of the soup is created. Buy the best you can. Second, the soup takes a bit of patience. The beef needs time to become tender. When it’s ready, you will know. And if you’ve never made egg dumplings before, they may seem a bit odd or confusing. They are almost paste-like. Here’s the thing though– just get them in there. Drop a bite-size portion into the hot soup, they’ll cook, and turn out beautifully. Finally, just how good this soup turns out will depend on the salt. The amounts I list below should be fine, but remember that every beef broth is different. Some are much saltier than others, so you’ll want to taste, taste, taste, as you add ingredients. Better to add more salt later, than ruin an amazing meal. I really hope you make this soup. There’s nothing else like it. 2 teaspoons kosher salt, plus a bit more. In a large Dutch-oven over medium-high heat, add 2 tablespoons of olive oil. 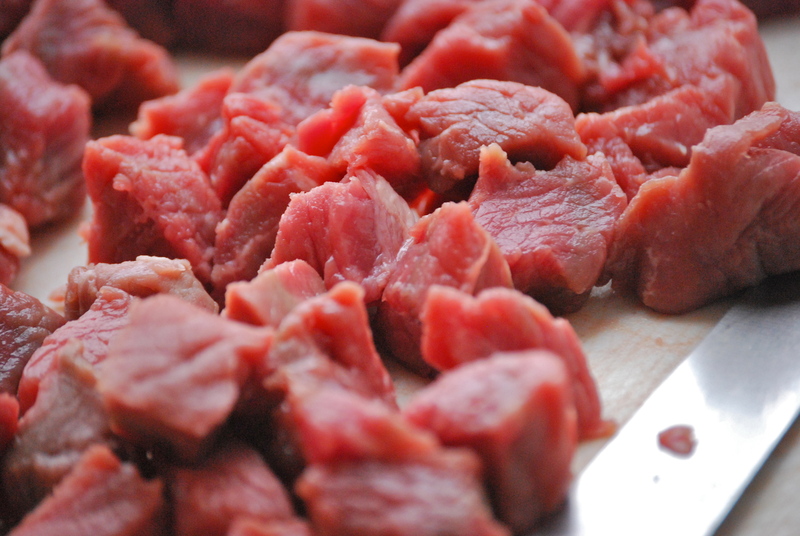 When it is hot, add the cubed beef and a sprinkle of salt and freshly cracked pepper. Stir the meat a couple of times, and cook for about 5-6 minutes. Transfer the beef, along with it’s juices, to a bowl and set aside. In the same Dutch-oven over medium-high heat, add the remaining 3 tablespoons of olive oil. 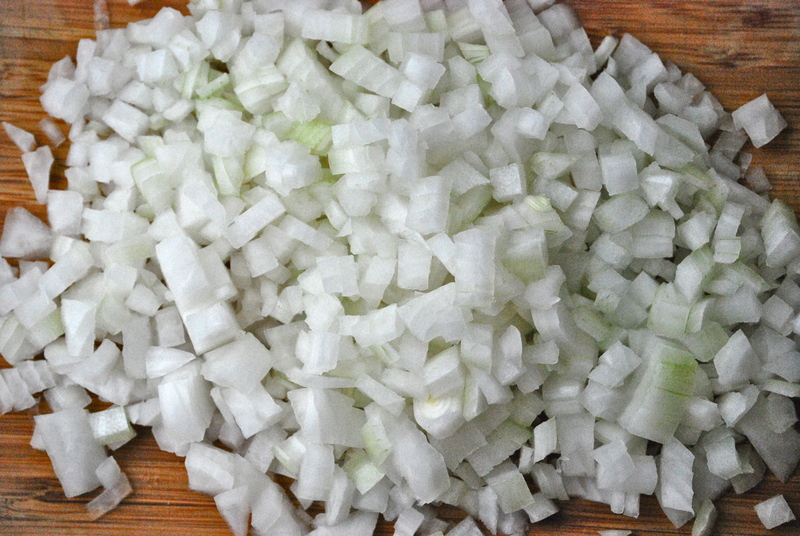 When it is hot, add the 4 cups of chopped onion. Cook for about 10 minutes, stirring often, until they become golden brown and are very fragrant. Still on medium-high heat, add 5 tablespoons of paprika to the browned onions and toast for about 30 seconds. Add 2 quarts of beef broth, the reserved cooked beef and juices, 1 teaspoon salt, and cracked black pepper. Bring to a boil. Reduce heat to simmer. Simmer on low-medium for about 2 hours, or until the beef is very tender. When the beef is tender, raise the temperature to medium and add the cubed potatoes. Cook for about 10-15 minutes, or until the potatoes are cooked through and tender, but not falling apart. Meanwhile, in a medium bowl, using a large spoon, mix the lightly beaten eggs with the flour and 1 teaspoon salt. It will form a sticky paste. This is normal. When the potatoes are cooked through, begin to add the dumplings one at a time. Using a small spoon, gently “plop” a bite-sized portion into the hot soup. You may want to use another spoon (or your finger) to help you. It will sink at first, and then float to the top. Repeat until all of the egg/flour mixture is in the soup. The soup will look crowded, and you will need to “push” some of the dumplings out of the way to make room for more. Once they are all in the soup, let them cook for another 5-10 minutes. At this point, taste the soup. Much of the flavor is dependent on the amount of salt. Add more if necessary. Remove from the heat and stir in the parsley. Enjoy with a piece of crusty bread. Please note that this soup is even better the next day!